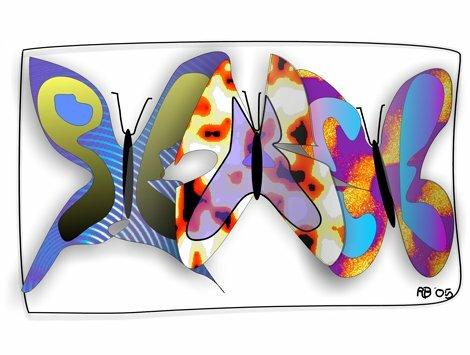 Rhizome | "Butterfly Primes . . . ~Prejudicial Numbers~"
This work comes at you from several approaches at once. The human side...that we have all been victims of number prejudice in our daily lives...is tightly woven within the rigors of higher mathematics...where in our quest for pure thought...our ingrained, inbred and embedded notions of choice nevertheless find expression in our most "objective" forays. Enjoy the beauty because it all counts. I have had a fascination with the visual patterns that numbers often make in various scenarios. In the process of looking at that most famous of classical Newtonian physics laws...the panoramic "Inverse Square Law"...I became curious as to how those mysteriously alluring and uncontrollable prime numbers might fit in. Surely, their squares, too, had some untold secrets. My investigation into prime number patterns raised a crucial question of prejudice. It was while I was in the middle of the little Q-&-A dialog about prejudicial numbers, and our attitudes and expectations about them, that this very question came to press on me in a relentless fashion. The answer to the number prejudices of the prime was to see how all the numbers played out...given the same and equal opportunity...to express their own private specialness. Indeed, what is found was as old as the hills...as old as the numbers themselves: Numbers don't lie. They don't cheat and they don't even call others names. People do. Notes & Observations: The challenge at the Art and Science interface is allow the viewer to see...to find...to discover that the beauty of Nature unfolds on so very many levels. And that is not just including mathematics, but is especially present in mathematics. While maintaining a challenge to the viewers interest, I have tried to deconstruct the thought pattern that went into the discovery of this amazing Butterfly Prime pattern on one side and some examples of graphical interpretations on the other.